You read that right, my friend. Not brining the turkey this year. Year after year, my husband was in charge of our Thanksgiving turkey. Every year, he brought out a large bucket and made his brining solution to brine the bird. We always enjoyed the juicy turkey. The real motivation was that I read this brine injecting method in Real Simple magazine (November 2016 issue) a while back, and I really wanted to try it. It said to inject a brining solution, or melted butter into the breast and legs before roasting. Well, I tried this method, and happy to report it works! I injected melted butter, because I’m using lots of herbs on the outside, but I think, next time herb infused melted butter, or even brown butter would be fantastic!!! And that’s not the only magic trick I used for this Thanksgiving turkey recipe. 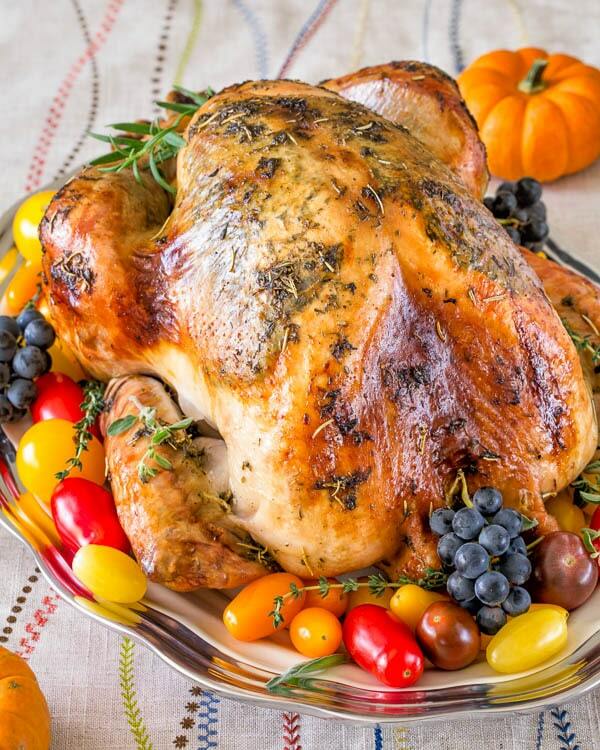 This roast turkey is special one, because it’s also roasted in champaign! It not only adds an amazing tang to the drippings, but it keeps the bird nice and moist! I have to give credit to this recipe on Allrecipes.com though. It has so many rave reviews, and rightly so! Now I’ll have to warn you about that tangy pan dripping. Because the champaign is reduced significantly, meaning the flavors are more concentrated, it has quite a tang. But IF used carefully, your gravy will be to die for! And I’m not saying this lightly. We’re not talking boring, same old turkey gravy here. (Nothing against tried n’ true gravy, but let’s be honest, it can get a little boring.) We’re talking bold flavorful turkey gravy that’ll go around the table non-stop. I’m telling ya, when we had faux-Thanksgining in September, I had to get up and refill the turkey bowl 4 times!!! It was that good! And when I say, use the dripping carefully, I mean add it little by little and adjust it to your taste. You can get the complete gravy recipe here. Now go on and give this recipe a test run before the big day. And please share your feedback. Thank you!!!! And here’s a quick video tutorial for ya. 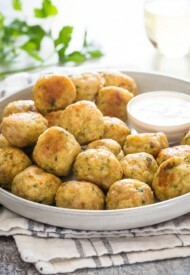 In a small mixing bowl, combine 1 stick of butter, garlic, parsley, rosemary, sage, thyme, salt and lemon juice. Mix until well combined. Smear the butter evenly all over the turkey and under the breast skin. (If the skin is wet, butter won’t stick. So make sure to dry the skin with paper towel well.) Place the turkey breast side up on a V rack in a large roasting pan. 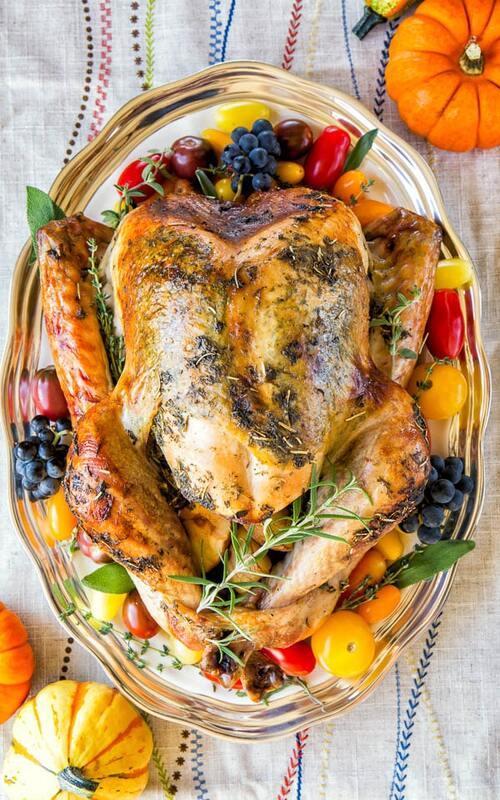 Fill the turkey with carrots, apples and fresh herbs. Melt the remaining 4 tablespoons of butter in a bowl. 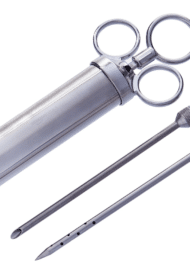 Using a marinade injector, slowly inject each thigh and breast halves with about 1 tablespoon of melted butter. Pour champagne and chicken stock over the turkey and into the cavity. Reserve pan juices to make gravy. But add the drippings into the gravy little at a time, as the champagne is reduced and flavors are concentrated. So adjust it to your taste. * I like to grate the garlic on microplane zester over pressing it, because it yields super fine puree that’s easy to smear. 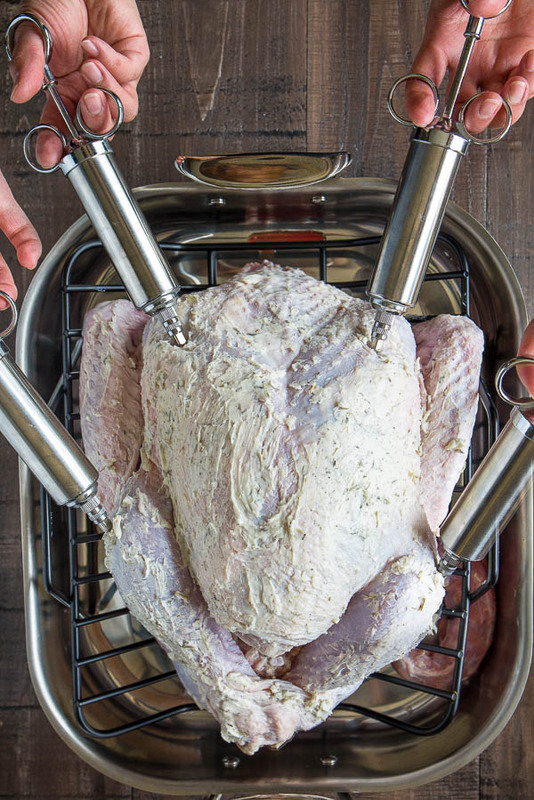 For complete turkey guide, read this TURKEY 101 post, where I cover everything you need to know from brining to carving. Don’t have Thanksgiving Menu yet? Check out my 2017 Thanksgiving Menu for inspiration. Plus, it includes complete schedule for prep and checklist for stress-free hosting! My turkey came out soooo unbelievable juicy. The white meat was was succulent! I followed each step on a 13.5 pound turkey and it was just superb. I’m sure I will keep this recipe going for many more years to come! Hi, Danika. So happy you tried and love the recipe. Thank you for sharing your feedback. BY FAR the best turkey I’ve every cooked and I’ve been cooking the family turkey dinner for over 30 years!! I had a 25lb Butterball for 14 people. I was left with almost NO leftovers and what little there was left was quickly taken home by guests. It was easier than I expected to make. I am not a cook and need to follow a recipe pretty closely. It was the most flavorful, moist turkey I believe I’ve ever had. The one change I did make was I cooked it at 325 in my convection oven. It was done in approx 3 1/2 hours. I will never again look for a new turkey recipe!!! Thank you!!! Hi, Kim! Thank you soo much for your feedback. I’m so happy to read your comment!! And your tip on convection setting is super helpful!! The. Best. Turkey! I bought a 21 lb Turkey and I made a family recipe for stuffing-so yes, I stuffed our Turkey. I still used the champagne but tried not to let too much get in the stuffing. I roasted it in an electric roaster at 350° to free up my oven. I figured 15 min per lb = 5 1/2 hrs. To my surprise, it was done in 5 hrs! 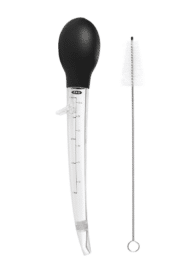 Thermometer read 220° (check in 2 different areas) when it only needed to be internal temp of 165°. I immediately started “resting” the turkey and I finished baking all other dishes for our Thanksgiving dinner. I sliced the meat and it was perfect! Moist & juicy! My mom is food snob and she said it was the best turkey she has had in yrs and I have to agree. I hate dry turkey and this was NOT dry. Will be making again! Thank you for the recipe! Loved it! Hi, Kimberly. Thank you so much for sharing your experience. A lot of readers ask about making this recipe in an electric roaster, and now I can refer them to your comment. I’m so happy everyone, including your mom, loved the turkey. I am wanting to make this recipe in my steam oven. 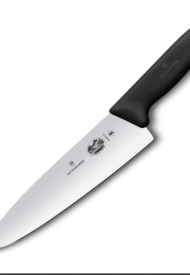 Any thoughts on cooking time? Hi, Alexis. Unfortunately, I have no experience with steam oven. Thank you for sharing this recipe it was outstanding!! By far the best Thanksgiving Turkey i have ever made and the gravy was out of this world! Yes, the gravy is the best!! Thank you, Gina, for your feedback! Used this recipe for my turkey, and it was AMAZING!! Made the gravy too. My family loved it! Thank you so much for sharing!! Yay, so happy you all loved it. Thank you, Shelly, for your feedback. I used your recipe last year and it was absolutley fantastic! This year I want to make it again. However, my husbands mom bought us a 22 1/2lb turkey. Could you please tell me how to use this recipe given that it is 8 1/2lbs larger? Thank you! General rule on roast time: 15min per pound. Hope this helps. Let me know how it turns out. Happy Thanksgiving! I wad wondering if you could bake it in a turkey bag? Will t flavors be the dsm? Hi, Gigi. I’ve never tried baking turkey in a bag, so I have no advice. I am going to be cooking a small 3lb turkey breast for Thanksgiving this year as it is just going to be for me and my fiancé. This recipe looks great, and I want to try it, but I’m not sure how much I should scale back the ingredients for such a small turkey. I’m afraid I might over season it. I was wondering what amount of seasoning you would recommend? And obviously my turkey doesn’t have a cavity to stuff with the apples, carrots, and herbs, so I would just skip that part. Do you think it would still taste okay? Thanks in advance! Hi, Kaitlyn. Yeah, skip the apples, carrots and herb stuffing. It’ll be fine. And I’d suggest using about 1/3 of other ingredients. Let me know if you have any questions. 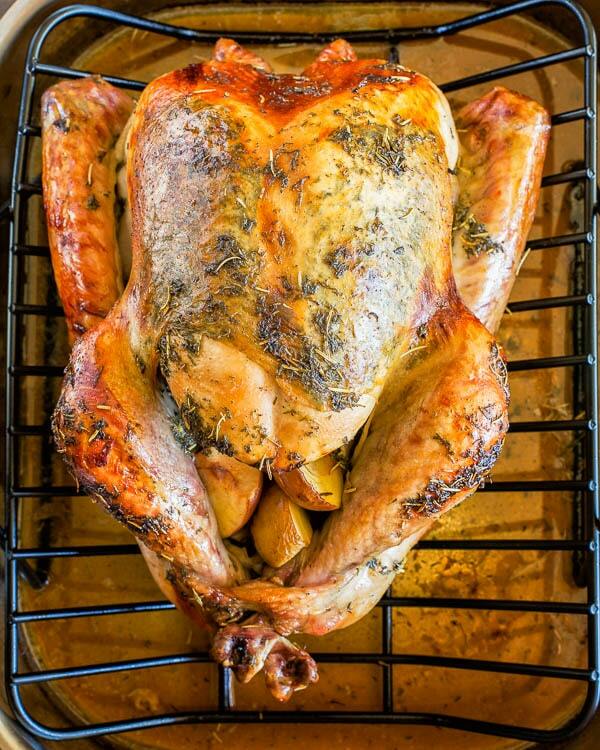 I made this turkey recipe last year for my whole family, about 30 people and I made the gravy from the turkey stock with her gravy recipe as well and it was a hit!!! The turkey was so delicious that I demanded I make it from now on so I know it’s done right! Lol thank you so much !! Looking forward to making it again in a week! So great to read your turkey success, Brittany! Thank you for your feedback. Wish you Happy Thanksgiving! 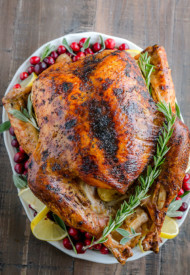 I’ll be making a 27 lb turkey, besides doubling the recipe, what adjustments should i make to the cooking time? Wow, that’s quite a turkey, Sheroz! I’ve never cooked that big of turkey, but I’d plan to cook it for about 6-7 hours. (General rule: 15 minutes per pound.) Good luck, and let us know how it turns out. Happy Thanksgiving! Would this recipe be too spicy for someone undergoing chemo? Hi, Nicky. There’s no spicy seasoning in this recipe, just herbs and butter, etc. Hi, Dolores. You can use cornstarch for gravy, but the cooking method would be different. Instead of making a roux (roasting flour in fat), you’ll need to make a cornstarch slurry (mix 2-3 tablespoons of cornstarch with 3 tablespoons water until smooth) and then add it to a boiling chicken stock. This is because cornstrach activates only when added to a boiling liquid. And then you can add pan drippings. Hope this helps. Let me know if you gave any questions. This recipe was so easy and it turned out so yummy!! My roommate and I threw our first Friendsgiving and we had almost 40 people! Oh and we had never made a turkey before and we were needing to make two 20lb turkeys!! Eek! We were very nervous and needed something straight forward. This recipe was a win! The video really helped and we also did some research on the Butterball website. Everyone really liked the turkey and it was a great success! I give it 5 stars for ease of making it, great instructions, and how tasty it was. Pria, SO happy to read your comment. Thank you so much for your feedback. Happy Thanksgiving! Thanks for the recipe. I made it last year it was delicious. but have you ever used it and cooked the Turkey in a roaster instead of the oven? Hi, Rose. So glad to hear you loved this recipe last year. I’ve never cooked turkey in a roaster though. Hi Shinee, my husband loves stuffing, especially when it comes from inside the turkey. Do you think it would be ok to stuff it? Hi, Jan. I’ve never tried this recipe with stuffing inside the turkey. But I personally wouldn’t because I’m afraid the stuffing will soak up most of champaign. Hi Shinee! Do you serve the carrots and apples you cooked inside the bird, or are those just to flavor the turkey? 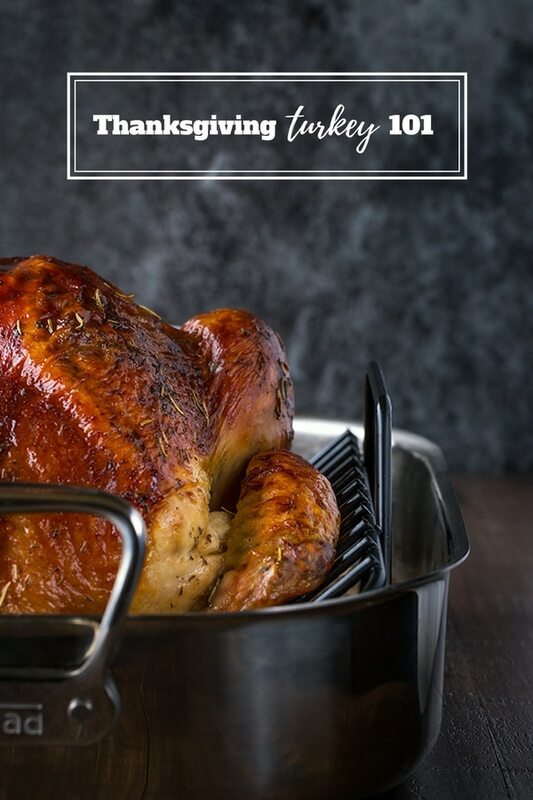 This year will be our first time hosting Thanksgiving and my first time cooking the turkey – your recipe sounds so good and has tons of awesome reviews, I’m excited to try it! Thanks! Hi, Sara. No, I don’t serve carrots and apples, they’re just for flavor. Thank you for asking, I’ll put that info in the recipe. 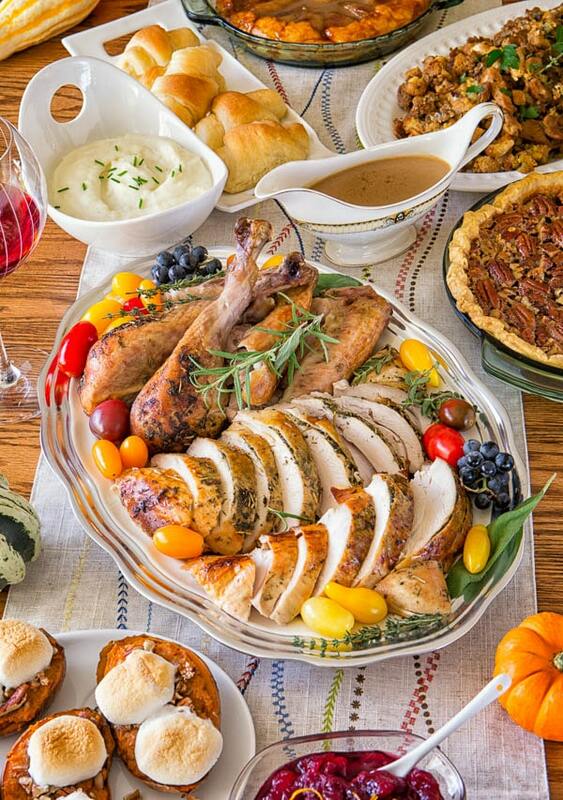 Hope you’ll love hosting your first Thanksgiving! Let me know if you have any questions in your preparation. Have fun! Hm really? We made this last year, and the apples may have been my favorite part! Hey, Dixie. Well, now I feel like I missed out!!! Thanks for letting us know. I used Korbel Brut champagne. This recipe sounds amazing. And the reviews are really awesome. I am planning to make it this year for Thanksgiving. But I would love to watch the tutorial videos. I do not have much experience with turkey. I do not find the videos on your website of either turkey or gravy. Could you send them? Thank you!! Hi, Monika! Thank you for reaching out. If you’re viewing this recipe on desktop, the video is right at the top below the title. But if you’re viewing the recipe on mobile, then the video is right above the recipe card. Hope this helps. But if you’re still having problem, here’s FB link to turkey recipe and gravy recipe. Hope this helps. Let me know if you have any more questions, and good luck!!! Please let me know how it turns out. Dear Shinee,Thanks for the videos! I still do not find them on your website though. I see “scroll down for the video tutorial” below the title above the first picture but I couldn’t find them. Anyway, I could use the links you sent me, so I watched them through those links. I made the turkey and IT WAS AMAZING. We celebrated with friends and everybody LOVED IT. I suggest everyone to try this recipe because it was SO DELICIOUS. I had some difficulty with the butter because it didn’t want to stick though I was drying the skin very well. So finally I used some extra salt and herbs on top. It also looked beautiful. Thank you for the recipe and your help! Oh, so happy you all enjoyed the turkey, Monika! Thank you so much for reporting back! My first turkey. So glad I found this recipe. I did substitute the champagne for apple cider and it still came out amazing! Thank you so much for posting this. Hi, Andrea! So happy to hear your first turkey was a success!! And glad this works just as great with apple cider. Thank you! ‘Tis recipe is amazing. The best turkey I ever made. I did use fresh herbs in the butter since I had them. Will be making this again. Awesome!! So happy the turkey was a success!! Thank you, Renee! Wow! We loved the recipe! the Turkey was delicious and gravy as well 👌👌Thank you for sharing. So happy you loved the turkey. And yes, gravy is soooo good too. Thank you, Erendira! I made this yesterday with a few modifications and it was amazing. We didn’t have a marinade injector so I went without and it was still very flavorful and not dry at all. I forgot the lemon and used fresh Sage, Parsley, and Thyme since it was available in the garden still. We do a new recipe each year just to keep me on my toes but I may save this and sneak it back into the rotation. Pernille, fresh herbs sounds amazing! I’m jealous that you still have them in your garden! 🙂 I’m so glad you loved the turkey, and thank you for your feedback! I made this today and I just want to say this is THE BEST turkey I have ever had. Our guests said that it was fantastic and gave many compliments. It was so juicy, tender, and full of flavor that I barely needed to season the gravy when I made it. Definitely is being saved for next year. Thank you so much for this recipe!! OMG, Renay, I’m so happy you all loved the turkey! I agree, it makes the best gravy! Thank you for sharing your feedback. Most Delicious turkey ever, and the gravy was Amazing!! Yay, so happy you loved it, Kathy!! Thank you so much for your feedback. 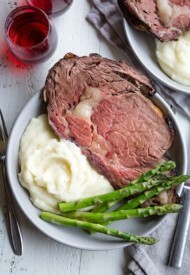 Do you use convection roast for the oven or bake for the 350 degree? Did you use any tinfoil before it was comlleted cooked to let rest? Hi, Rob. I roasted the turkey at 350°F traditional oven (I don’t have convection settings). And yes, I used tinfoil during roasting when the skin was browning too much. And I cover the cooked turkey with foil while it rests and before carving. Hope this helps. Happy Thanksgiving! Hi, Jorge! Sorry about that. You’ll need about 1 tablespoon of grated garlic (4-5 cloves). And thank you so much for pointing it out. I updated the recipe accordingly. I can’t seem to find the gravy receipe, the link posted above takes me to a chocolate mousse cake. Oops, sorry about that, Lua! 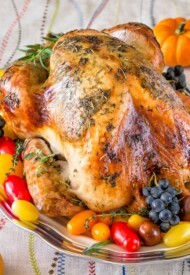 Here’s the link for gravy: https://www.sweetandsavorybyshinee.com/turkey-gravy/. Hope you enjoy! Should we let it sit with butter on top or can I pop it in the oven right away? Hi, Wendy. You can pop it in the oven right away. Any thoughts on using a dry white wine in place of the champagne? Hi, Amber. I think that would be as delicious! Let me know. Hi Shinee, this recipe looks like something I want to try. 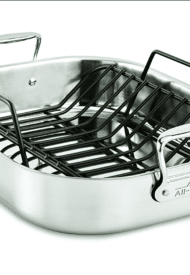 Do you think I can follow this recipe using an electric roasting pan? And will be just as fantastic as yours? Hi, Kim. Honestly, I have no experience with electric roasters and I really don’t know how this recipe will turn out when cooked in a roster. Sorry, I’m not much help. I was curious about the amount of salt, it doesn’t seem like a lot for a big turkey. So it’s my understanding that most frozen turkey already comes in sodium solution, and doesn’t require much additional salt. 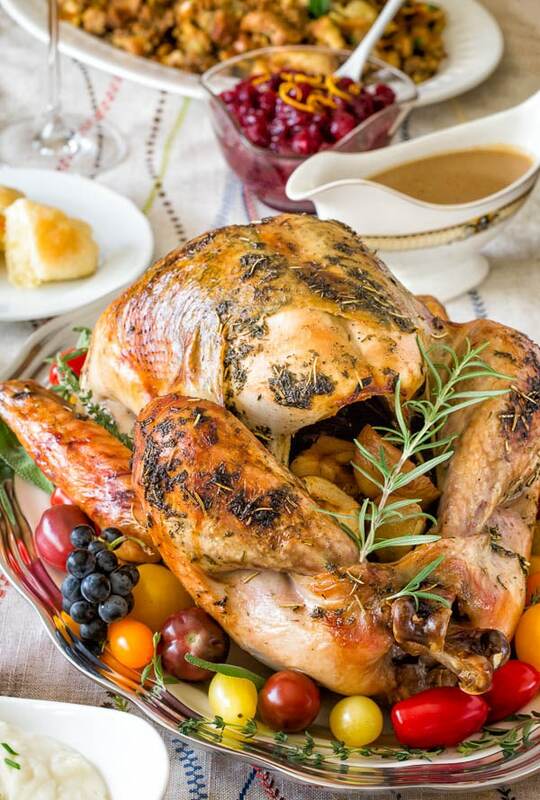 If you’re using fresh turkey, or not brining your bird, feel free to add another tablespoon of salt. But with butterball turkey, I didn’t need anymore salt. Hope this helps. Happy Thanksgiving, Jackie! Hello! I seen in one of the comments that lemin juice should be added to the butter for injector. I must have missed where u say how much lemon juice to add for that. Thanks! Hi, Megan. No, the lemon juice goes in to butter with herbs (step 4), which is smeared on and under the skin. You’ll need juice of 1 lemon, (1-2 tablespoons). Hope this clarifies everything. okay thanks. I was getting confused. Trying this out tomorrow for my family. Sounds great! Let me know how it turns out, Megan! Have fun with your family! Hi! Could i still use this recipe if i buy a butterball turkey? Or would that be too much salt and butter? I used Butterball frozen turkey, and it wasn’t salty at all. And butter amount was perfect, because butterball doesn’t use butter in their brine. Hope you’ll enjoy, Brittany! Yay, Brittany! I’m beyond happy to hear everyone loved the turkey! Thanks so much for coming back and sharing your feedback! Okay I’m wanting to do this recipe for thanksgiving I’m using a 19 pound turkey what would be the measurements for the herbs ? Hi, Giovanna! You can use the same amounts. It’ll be fine. And I’d love to hear your feedback after the holidays. Let us know. Happy Thanksgiving! Yay, so excited fro you, Burna. Please stop by and leave your feedback after Thanksgiving. 🙂 And I hope you enjoy! Happy Thanksgiving! I’m assuming the alcohol content burns off. I’ve got little people eating at my house. This does sound and looks truly delicious. Was curious if the actual Turkey tastes tangy? Also with the chicken broth it sounds like a lot of liquid in the turkey pan. Is that more like poaching or steaming? I am making this regardless. Just curious if I should make a plain one for the grandchildren. Hi, Cindy. No, turkey meat doesn’t taste tangy at all. And I don’t feel like it’s steaming the bird because we’re not covering the whole thing with a foil. Hope you’ll enjoy, and please share your thoughts if you give it a try. I normally make 2-3 large turkey breasts in the crock pot for Thanksgiving. I love the idea of using champagne. Do you think it would turn out well in the crock pot (ingredient portion adjusted for size of turkey, of course). Hi, Sally. I don’t think it’ll work that great in a crockpot, because I love how champagne concentrates in the oven. And I don’t think the liquids will concentrate in a slow cooker. But then again, I’ve never cooked turkey in slow cooker, so I’m clueless. I have a family member with a severe dairy allergy and use olive oil. Do you think that would work? Hi, Kat. I’m not sure how it’ll turn out with olive oil, as I’ve never tried that way. Sorry. Hi, Sio. I find that pan drippings alone isn’t enough to make plenty of gravy, so I use additional plain chicken or turkey stock. I got about 10oz of pan drippings with this recipe. I added 5oz right away, then added more to taste. And by the way, I just posted the gravy recipe on the blog. Here’s the link to the recipe and video. I’d like to try this recipe, but I have a family member with a rosemary allergy. Can I omit it or substitute another herb for the rosemary? Hello Shinee! This looks TREMENDOUSLY GOOD! I had a question for you: my family loves big turkey’s…I usually grab a 20-24 pound bird and always go for Butterball. If I do that again this year, would I omit the butter injection step as Butterball does this already? And, if I do a 20-24 pound bird, would I increase any of the ingredients? Thank you so much! I’m so excited to try this! Hi, Alyssum! Thank you!! I didn’t know Butterball already injects butter into the turkey. I did use butterball turkey, and I say more butter better. 🙂 And yes, I’d suggest increase herb butter by 1.5 times for 20-24lb bird, but no need to increase champagne or anything else. Hope you’ll enjoy, and let me know if you give this a try. Thank you so much for the reply! Will do! 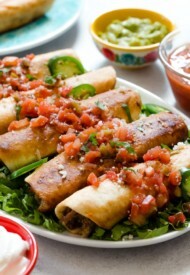 I’ve been all over your archives and pinning so many lovely recipes! I can’t wait to enjoy them all! Aww, thanks so much for sharing my recipes. And let me know if you try any of them! What size turkey did you use? Hi, Laura. I used 14lbs turkey here. Turkey has always intimidated me. This sounds amazing! I can’t wait to try! Yeah, I know that feeling all too well. It’s not as difficult though, Sumner. Hope you give it a try, and let me know how it turns out, if you do. Thanks! What an amazing recipe! I will have to try making it soon!